All Smiles Dentistry, P.C. (New York) - Book Appointment Online! 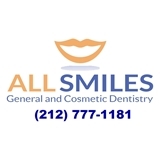 Please visit www.allsmilesnyc.com to learn more about Dr. Lane! Everyone was absolutely attentive and professional. I definitely recommend! I love her! She's the best dentist I've ever had. She's so nice and very gentle. Highly recommend.